This 3' X 5' flag is digitally printed on outdoor knitted polyester. Features reinforced stitching on the fly end. Flag is finished with reinforced canvas header and two brass grommets. Made right here in Sparks by us. Rally flag. canvas reinforced canvas header and two brass grommets. 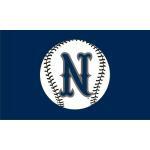 The 3' X 5' is imported, Navy back ground with white logo and lettering. 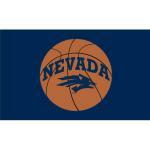 New Officially Licensed Nevada Wolf Pack Basketball THE HUNT Flag. Made of quality outdoor knitted polyester. 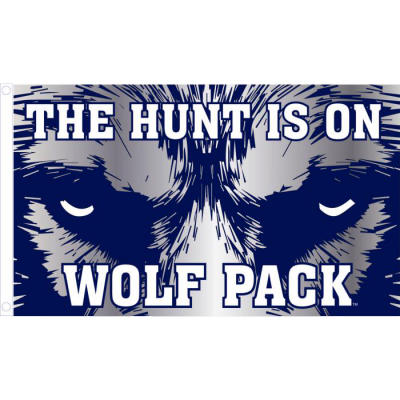 Featuring the THE HUNT this flag is 3' X 5' and finished with header and grommets. Made by us right here in Sparks. 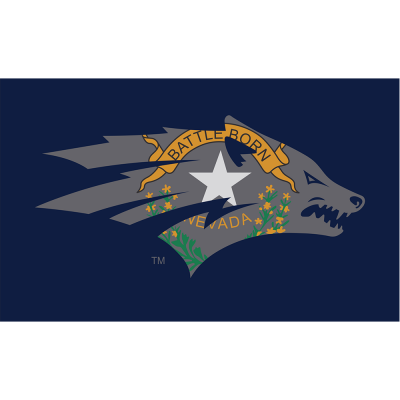 New Official Nevada Wolf Pack Battle Born Flag. 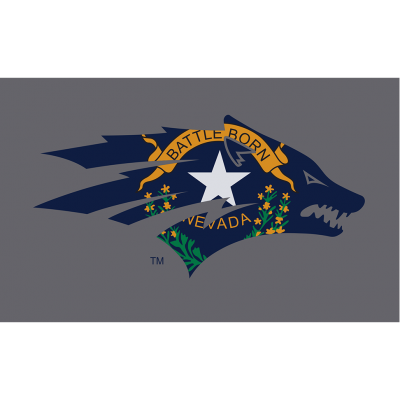 Featuring the Nevada flag Battle Born symbol. Flag is 3' X 5' and finished with header and grommets. Made by us right here in Sparks. 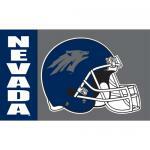 New Official Nevada Wolf Pack Battle Born Flag. Made of quality outdoor knitted polyester. 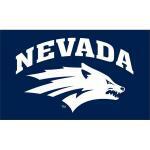 Featuring the Nevada flag Battle Born symbol. Flag is 3' X 5' and finished with header and grommets. Made by us right here in Sparks. 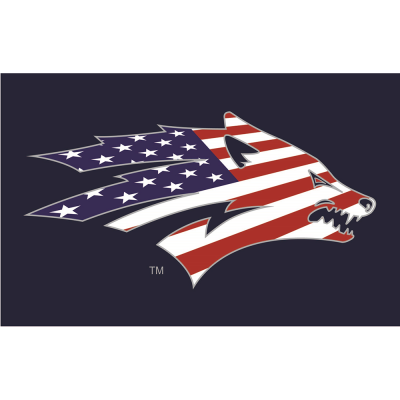 This 3' X 5' USA Wolf Pack Flag is digitally printed on outdoor quality knitted polyester. Features reinforced stitching on the fly end and finished with reinforced canvas header and two brass grommets.. Made by us. 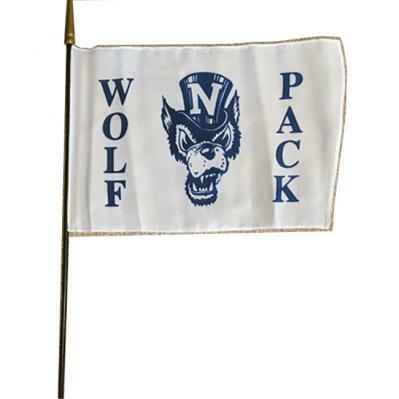 This 3' X 5' Wolf Pack Flag is digitally printed on outdoor quality knitted polyester. Features reinforced stitching on the fly end and finished with reinforced canvas header and two brass grommets.. Made by us. 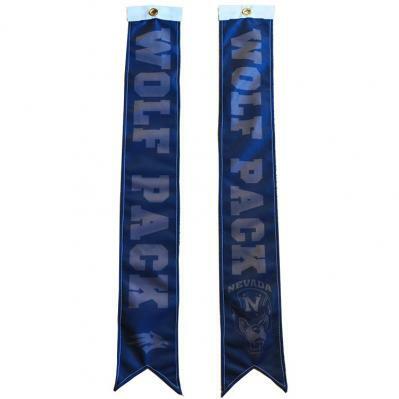 We found these old school Wolf Pack Stick flags in the back room. They are 8" X 12" and made of beautiful Rayon. Mounted on a black 20" staff with gold wood spear top. Great for waving at the game or in your planter box. Made proudly in American. While supply lasts. This 3'x5' flag is silk screened and made out of a poly-cotton blend material. Flag is finished with header and brass grommets. 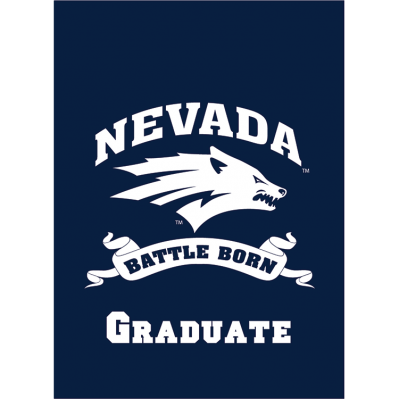 New double sided banner style Battle Born Graduation Banner. Banner is 30" X 40". Made of quality outdoor knitted polyester and made right here in Sparks by us. 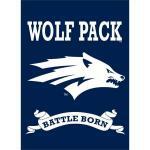 New double sided banner style Old Wolf Pack Graduation Banner. Banner is 30" X 40". Made of quality outdoor knitted polyester and made right here in Sparks by us. New two sided banner style flag Banner. 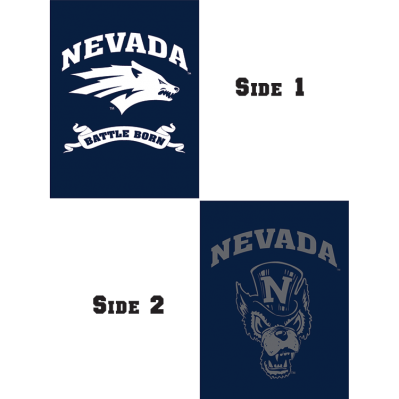 Has Battle Born image on one side and Old Wolf image on the other. Banner is 30" X 40". Made of quality outdoor knitted polyester and made right here in Sparks by us. 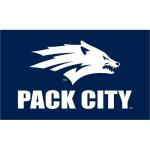 Pack City Flag. 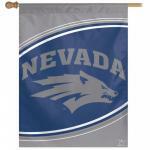 This 3' X 5' flag is digitally printed on outdoor knitted polyester. Features reinforced stitching on the fly end. Flag is finished with reinforced canvas header and two brass grommets. Made right here in Sparks by us. 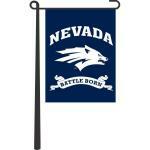 Nevada Battle Born 30" X 40" Decorative Banner Flag is made of outdoor knitted polyester. Flag is finished with a pole sleeve at the top of the flag, with sewn in tabs.. Price is for flag only. 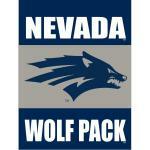 Nevada Wolf Pack 30" X 40" Decorative Banner Flag is made of a poly-cotton blend material. Flag is finished with a pole sleeve at the top of the flag, with sewn in tabs.. Price is for flag only. 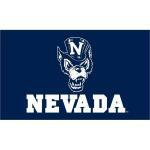 Nevada 3-panel 13" X 18" Garden Banner Flag is made of a poly-cotton blend material. Flag is finished with a pole sleeve at the top of the flag. Price is for flag only. 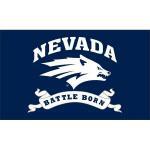 Nevada Battle Born 13" X 18" Garden Banner Flag is made of a poly-cotton blend material. Flag is finished with a pole sleeve at the top of the flag. Price is for flag only. 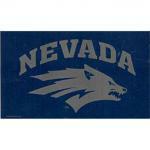 Nevada Wolf Pack 11"x15" Garden Banner Flag is made of a poly-cotton blend material. Flag is finished with a pole sleeve at the top of the flag. Price is for flag only. 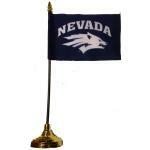 Nevada Wolf Pack Desk Set, flag is 4" X 6" on black 10" staff with gold spear tip and gold plastic base. 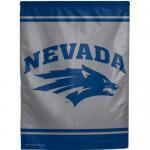 Made of quality polyester material for display outdoors or indoors. Size 27" X 37" Finished with pole sleeve at the top with sewn in tabs. Go Pack. Stay True. Proudly made in America. 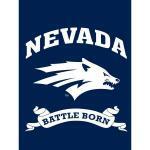 Nevada Wolf Pack Battle Born Graduation 13" X 18" Garden Banner Flag. Flag is double sided and is made of outdoor knitted polyester. Flag is finished with a pole sleeve at the top of the flag. Price is for flag only. 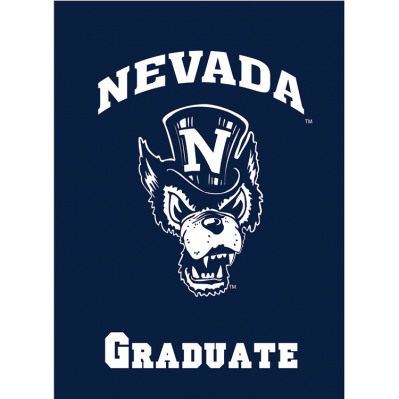 Nevada Old Wolf Graduation 13" X 18" Garden Banner Flag. Flag is double sided and is made of outdoor knitted polyester. Flag is finished with a pole sleeve at the top of the flag. Price is for flag only. 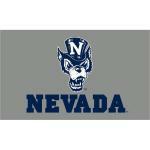 Nevada two image Graduation 13" X 18" Garden Banner Flag. Flag is double sided with Old Wolf on one side and Battle Born image on the other. Made of outdoor knitted polyester. Flag is finished with a pole sleeve at the top of the flag. 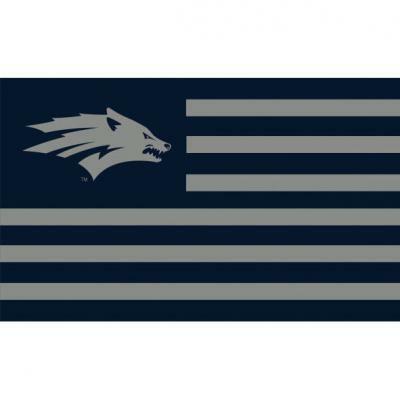 New size for your boat or RV, this 12" X 18" Wolf Pack flag is made of outdoor knitted polyester and reads on both sides of the flag. Finished with canvas header and two brass grommets. Made right here in Sparks by us. 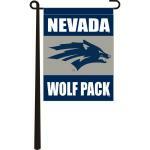 Officially licensed Car Flag made with a durable knit polyester flag. Two sided imprint. 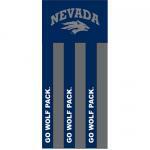 The Car Flag measures 11.75" high x 14" wide and is attached to a 20.5" long-lasting vinyl pole. Car flags make a great statement throughout the year. Made in USA. Not recommended for prolonged freeway use. This 40" windsock is silk screened and made out of a poly-cotton blend material. Designed and manufactured by us. These 5" X 36" fabric streamers are made out of a good quality knitted polyester material and finished with a reinforced canvas header and one brass grommet at the top so you can easily attach your streamer to your pole that goes off the side of your home or business. (We don't recommend these for an in the ground flagpole). Choose between New logo or old logo.